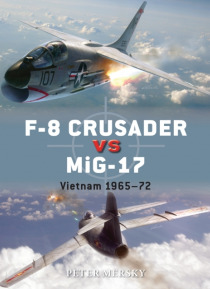 Revered by Naval Aviators as the 'last of the gunfighters' due to its quartet of Colt-Browning Mk 12 20 mm cannon, the F-8 Crusader enjoyed great success against VPAF MiG-17s during the Rolling Thunder campaign of 1966 68. But, the MiG-17's unequalled low-speed manoeuvrability, small size and powerful cannon armament meant that the American forces didn't have it all their own way. This fully illus… trated book, featuring photographs, maps and battlescene artwork, reveals the tactics that were developed by pilots on both sides to give themselves the edge in air-to-air dogfights, allowing the reader to understand how the differing design and development doctrines played a part in combat.